Next week sees the start of the 2016 Olympic Games in Rio De Janeiro. Enthusiasm for what should be the biggest event of the sporting calendar has been dampened by a myriad of issues, including crime, the zika virus, a hastily-built and entirely unliveable Olympic Village, and around two million tickets unsold. But this hasn’t deterred Google. It has just announced a major update to its search product which will allow fans to follow the games closely. Google can now tell you the national medal count, who won a particular competition, and the schedule of events. All you need to do is fire up the search engine on your laptop or mobile device, and type the name of the event or the athlete, or simply “rio 2016“. 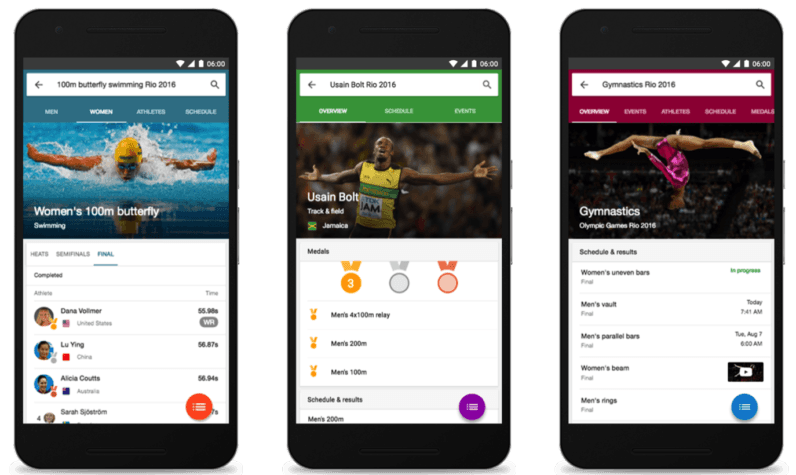 On the Google App for iOS and Android, users can even register for push alerts to find out when an event has finished, or if a particular athlete has won a medal. And if you can’t follow the proceedings on your television, YouTube will stream video highlights from broadcasters in over 60 different countries. It has also said that it will deploy 15 ‘top creators’, who will be livestreaming the events. It hasn’t said who they’ll be, though. Finally, Google Maps StreetView now lets you explore Rio, seeing sights like the Cristo Redentor and the Praia de Copacabana without stepping foot outside of your house. Google’s update isn’t live yet. That’ll likely happen on Friday, when the opening ceremony is scheduled to take place.